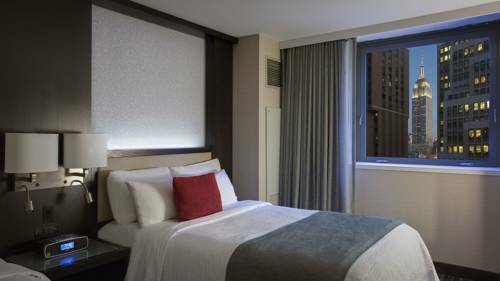 Find your slice of comfort in the City That Never Sleeps when you stay at Courtyard New York Manhattan/Times Square. As one of the premier hotels near the heart of Times Square, we invite you to experience the excitement of the Theater District, Madison Square Garden, Central Park and Rockefeller Center, all within walking distance of our front doors. Following an adventure-filled day, retreat to unrivaled relaxation in our spacious rooms featuring free Wi-Fi, large work desks, flat-panel TVs and luxurious bedding. Head to nosh! and enjoy mouthwatering breakfast options and specialty Starbucks beverages in the morning and bistro-style fare with cocktails, beer and wine in the evening. During downtime, enjoy a brisk workout in our state-of-the-art fitness center, or stroll through the world-class museums and shopping Manhattan and Times Square are known for all just minutes away! Book your next getaway or business trip today and make your visit to New York City one you'll always remember. Enjoy bistro-style dining and a casual, modern atmosphere at nosh!, the Courtyard New York Manhattan/Times Square's signature caf . We serve healthy fare and Starbucks coffee in the morning, as well as laid-back dinner options with beer and wine. - Opened in 1986, the Marquis Theatre is one of the newest theatres to be built on Broadway. - NBC "The Today Show"